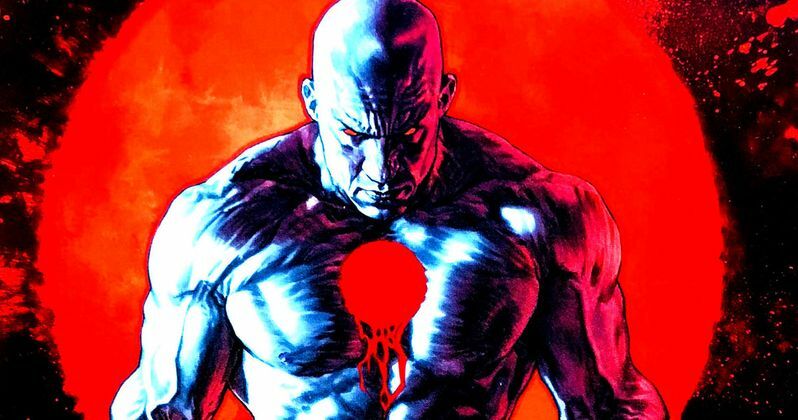 We have our first look at Vin Diesel as Bloodshot. Sony is doing what they can to get into the comic book movie game while Spider-Man is hanging out with The Avengers over in the Marvel Cinematic Universe. Part of that involves adapting some Valiant Comics properties for the big screen and first up is Bloodshot, which has Vin Diesel in the role of the titular character. Now, thanks to a newly revealed comic book cover, we know what the Fast and Furious star is going to look like in the role. The image looks faithful to the character and it also looks like Vin Diesel at the same time, only with pale skin and a big red dot on his chest. In any case, it looks like they got the right man for the job. As for the image, it's the cover for what is being billed as the rarest Bloodshot comic ever, which was created for charity and signed by Diesel himself. It was made for the upcoming Game4Paul, which benefits Reach Out Worldwide, the organization founded by the late Paul Walker. Here's a full description of the comic. This one-of-a-kind edition of the Bloodshot Salvation #12 comic book features the exclusive cover with art by comic artist Lewis LaRosa, who is apparently Vin Diesel's favorite Bloodshot artist. The art for this truly unique collectible was originally commissioned by former Valiant Comics CEO and Chief Creative Officer Dinesh Shamdasani, who received the request director Dave Wilson, who is at the helm for Bloodshot. The art was given to Diesel as a gift and reveals likeness as the character for the first time. And now, it's going to benefit a good cause as one of the items fans can win during this year's Game4Paul event. As for the movie, not much has been revealed about Bloodshot just yet. It's been in production for a couple of months, but the studio has yet to release an official synopsis or anything of the like. The cast also includes Guy Pearce, Sam Heughan, Eiza Gonzalez, and Toby Kebbell. Originally, Michael Sheen was scheduled to appear in the movie but due to scheduling conflicts, his role was given to Pearce at the eleventh hour. The script comes from Jeff Wadlow and Eric Heisserer. For Sony, the hope is that they can use this as the building blocks for a multi-franchise crossover event, which will ultimately lead to a Harbinger Wars movie. But let's not get too ahead of ourselves on that front just yet. Bloodshot is set to hit theaters on February 21, 2020. If you want a chance to win this special comic book for yourself, entries are $20 and you can head on over to the Game4Paul website to throw your hat in the ring. Or, if you just want to have a look at Vin Diesel in character, you can check out the image for yourself below.